Change the "Ship To" Address - If you are placing your order as a gift to be shipped to a different address, you will need to change the "Ship To" address in PayPal prior to completing your purchase. Your billing address will automatically appear as the shipping address. To change this, click the "Change" link, then click "add an address" and enter the correct shipping address and click Save. Include a message for the gift tag - If you would like to add a special message on a gift tag, please let us know by using the special instructions box during checkout. Click the link that says "Add instructions", type your message in the box and click Save. demonstration of your generous nature. a specialty loaf of the day, six giant cookies, and our famous Granola. arrangement featuring a loaf of Honey Whole Wheat, the speciality loaf of the day, the cake bread of the day, six giant cookies, one pound of Granola, a jar of gourmet jam, and a Great Harvest Bread knife. Honored in most Great Harvest Bread stores across the nation. Available in any amount. Always fresh, always appreciated! desired Gift Card amount in the "Price" field. Our most popular combination includes a loaf of Honey Whole Wheat, six giant cookies, and a jar of gourmet jam. Breadboard not included. All items will be shipped in a Great Harvest Gift Box. No shipping charge for Gift Cards! 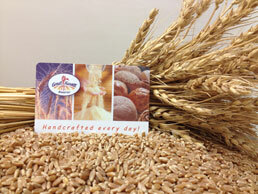 Sign up for our Email Newsletter, get a FREE loaf of Honey Wheat!